Twenty-nine cents have gotten in the way of a petition for all business students to stop funding six fee-levy groups. The Concordia Student Union’s Judicial Board intended to consider at its hearing on Tuesday whether it was prejudicial to ask in a single question whether business students should automatically be opted-out of paying fees to six campus groups—Art Matters, Cinema Politica, CUTV, the Concordia Food Coalition, Le Frigo Vert and Quebec Public Interest Research Group-Concordia. But no such ruling was given. Instead, a math error will prevent the question from going to a vote in the union’s general elections taking place March 25 to March 27. The petition, brought to council on Feb. 12 by three executives of the Commerce and Administration Students’ Association, miscalculated the total per-credit savings. 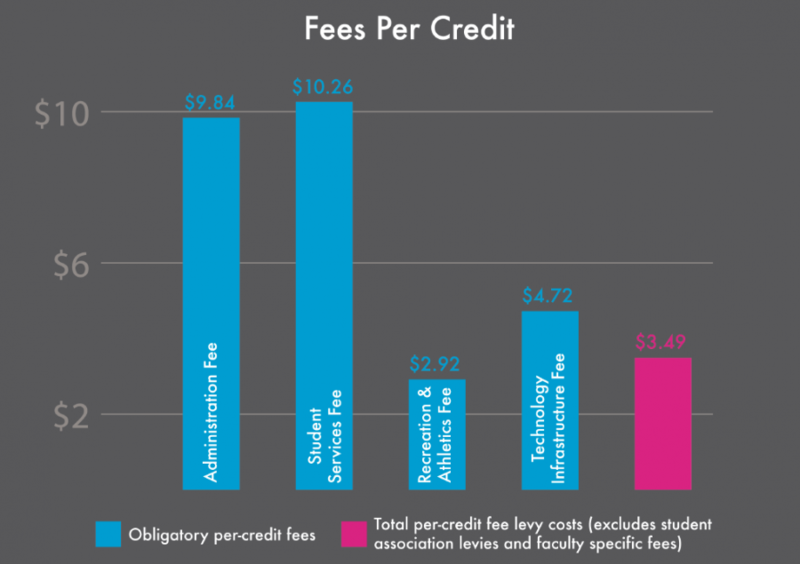 While the six groups cost students a combined $1.21 per credit, the petition stated business students would save $1.50. The discrepancy amounts to more than the combined cost of Art Matters, Cinema Politica and the Concordia Food Coalition. When the discrepancy was brought up at the hearing, CASA VP External and President-elect Michael Richardson remained confident the addition flub would have no bearing on their ability to get signatures. “If you want me to get these 500 signatures, I can get them in the remainder of the meeting,” said Richardson at Tuesday’s hearing. The hearing was requested by CSU chief electoral officer Andre-Marcel Baril. CSU Bylaw 9.6 states that a petition must attain at least 500 undergraduate signatures to be presented to council as a potential referendum question. But with campaigning season already underway, that petition will have to wait until the union’s next elections. “We’ve been attacked in very derogative terms,” said Richardson at the hearing, who maintains business students are being misrepresented as villains over the issue of fee levies, both on social media and in the opinion pages of this newspaper. Richardson was quoted at a CSU council meeting last month saying petition signatories did not know the consequences of fee-levy groups losing their funding from business students. He said at Tuesday’s hearing that he wants to work with these groups to see how they can better serve the students that fund them. Business student Kabir Bindra, who represents the John Molson School of Business on CSU council along with Richardson, told The Link last month that he believes most business students don’t use these six groups or even know they exist. “We would never, ever cut crisis centres, or anything with the environment […] because they are so critical to students,” said Richardson. JMSB students make up about 20 per cent of Concordia’s total student population. A second hearing is taking place on Friday to rule on complaints made by QPIRG-Concordia and the Centre for Gender Advocacy regarding the second fee-levy petition brought to council on Feb. 12. QPIRG also opposed having multi-part referendum questions on the ballot. They say each group would need its own question, notwithstanding their objection in principal to per-faculty opt-outs. “Lumping disparate, separate, completely unattached groups is prejudicial,” said QPIRG-Concordia volunteer and administrative coordinator Christina Xydous, noting one group’s bad reputation could hurt groups in the same question. But due to the math error in the petition, it’s still unknown whether the Judicial Board would allow an omnibus-style question like this in the future.